I have to admit that I am not a fan of American whiskey in general. Bourbon I normally find too sweet or too woody, also less complex the scotch. There are some great ones out there, just not this one maybe. Now there's also a lot of rave reviews out there and some that agree with me, so I think this whiskey is very person dependent. Anyway, it is Balcones Brimstone. 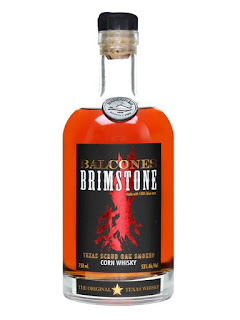 It's Texas corn whiskey that Balcones have bubbled smoke through. Not peated, they bubbled Texas scrub oak smoke through the whiskey. It is innovative, I'll give them that. Nose: Weird! Synthetic, smoke!, burning plastic, holding your face directly above a bonfire, the smell of your clothes after a bonfire, liquorice and aniseed. Taste: Synthetic, burnt plastic, cheap peppered steak, burnt corn paste, starchy, weird! Finish: Long length. Super intense, really kicks up with smog and plastic bonfire. Notes: UGH! Weird and synthetic to me.